During 2012 and 2013 Drawing Room will present two six month long exhibitions within UBM’s London headquarters on the 9th Floor which will showcase the work of emerging, professional artists living or working in the Borough of Southwark. Parallels of Latitude brings together the work of seven artists who are engaging with contemporary ideas around landscape. The works and approaches taken by the artists are varied, extending the boundaries and potential of landscape as subject. Whilst some artists engage with art historical ideas related to landscape and wilderness, others map personal journeys or work directly with the elements. Other artists within the exhibition extend ideas of landscape to include distant and unimaginable places below and beyond the earth's surface. The exhibition which includes painting, collage, photography and drawing, takes its title from geographical and mapping terminology. In cartography, parallels of latitude are imaginary lines which run east and west around the surface of the earth, parallel to the equator. Combined with the meridians of longitude, they form an invisible grid over the earth and enable locations on the earth's surface to be precisely mapped. The territory that the artists within Parallels of Latitude cover is wide, from the smallest elemental structures to our place within the solar system - from micro to macrocosm. Many of the artists within the exhibition explore the impact of human presence on the land. Jessie Bond's collages and photographs revolve around ideas of the natural within the man-made landscape. Exploring the gap between highly constructed environments and ideas of countryside as wilderness, Bond looks at how much of what we consider to be natural has been shaped over centuries through politics, changing land uses and trends in taste. Like Bond, Ben Deakin's paintings and drawings explore ideas of wilderness, but focus in particular on how our nostalgia for nature has been inherited from the 19th Century Romantics. 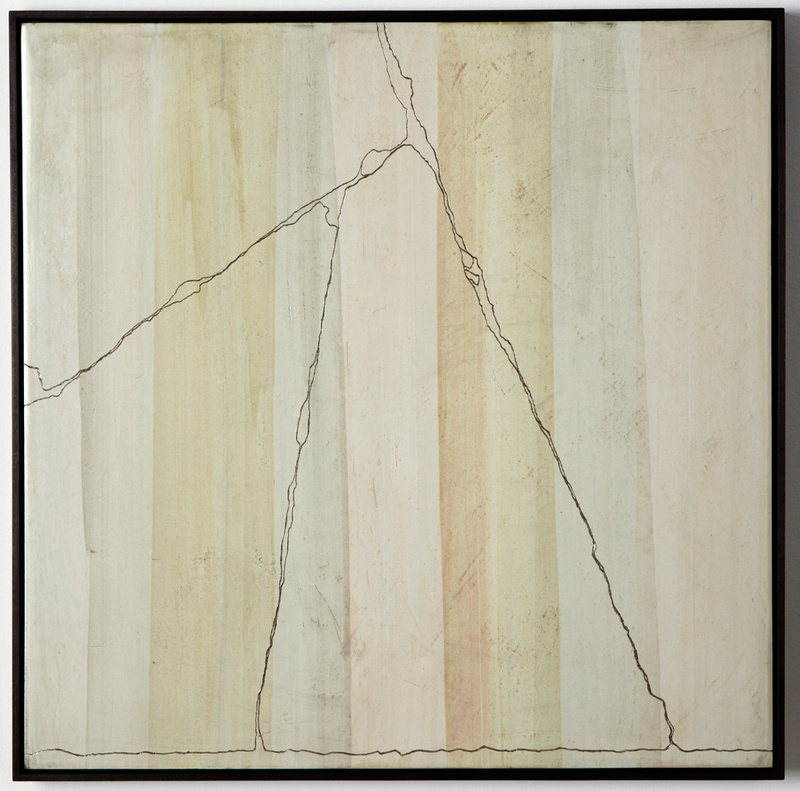 Many of Deakin's works incorporate the iconography of this period – mountains, forests and glaciers – whilst also featuring objects or constructions that appear to have been abandoned or taken over by nature. In his recent paintings, Andy Jackson responds directly to the city scape around him, mapping journeys and traces of human presence and intervention. Paving stone cracks are traced and then meticulously etched onto the surface of his paintings. In other works, gestural, painterly marks oscillate between abstraction and representation, bringing to mind organic forms, fossils or archaeological traces. Other artists engage directly with the natural elements in their works, through observation and documentation or by direct exposure of works to the outdoors. In Sam Messenger's series of Untitled works, meticulously detailed grid like structures are drawn over inky grounds. The grounds result from a process in which paper is firstly soaked in river water and then left outdoors in freezing conditions to respond to the elements. Each surface is unique, containing accidental creases and blemishes and intricate fern like patterns which result as a consequence of the freeze/thaw process. Similarly, observation of nature and the elements are linked inextricably within the work of Haruka Hashiguchi. Hashiguchi traces the movements of sunlight and shadow, creates imprints of absent objects in starched fabric, addresses the passing seasons or bottles her own exhaled breath. Her works are empirical but not scientific, registering the embodied, human experience of the artist. In contrast some artists with Parallels of Latitude extend ideas of landscape beyond the surface of the planet to include distant and unimaginable places – from the depths of the ocean to the outer reaches of space and distant galaxies as viewed by telescopes and satellites. The idea of artist as explorer is central to the work of Pippa Gatty, whose work draws from an archive of imagery redolent of the visual reportage of the National Geographic in its heyday. In her Drawing Nebulae and Interstellar Matter series of works, Gatty explores how ideas of landscape have expanded since the moon landings of the 1960s and 70s, to include the universe. Similarly Inês Rebelo's works include images and text from scientific publications used to map and study distant events, such as underwater scenes or wider to stars and galaxies. Rebelo's re-contextualised and re-presented facts often carry a humorous tone by confronting us with the absurdity and ultimate futility of mapping and creating diagrams as a means of understanding our place in space. The depicted singular phenomena and scientific facts no longer operate as uncontested truths and, instead, resemble curiosities in which we can choose to believe or not. During 2012 Drawing Room will present two six month long exhibitions within UBM's headquarters on the 9th Floor which will showcase the work of emerging, professional artists living or working in the Borough of Southwark. Parallels of Latitude is the first exhibition in this series and brings together the work of seven artists who are engaging with contemporary ideas around landscape. The exhibitions will feature works by artists working across a range of media such as painting, collage, drawing and photography. This is the first stage of a unique collaboration between UBM and Drawing Room to promote and support emerging artists within a local and global company environment. During the exhibitions, Drawing Room curators and participating artists will give lunch time talks, enabling UBM staff to gain further insight into the exhibition and find out more about the artists involved. This collaboration also trains an emerging curator, providing them with the opportunity to support the professional development of emerging artists within Southwark and to gain invaluable practical experience of working collaboratively with both Drawing Room and UBM. Parallels of Latitude was curated by Jacqui McIntosh (Project Leader, Drawing Room) and Rebecca Newell (UBM Curatorial Intern).